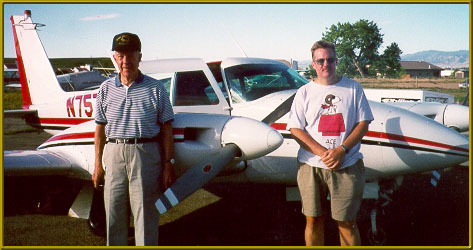 The author, who practices law to support his 100LL habit, and his father prepare to embark on a cross-country barnstorming trip in a 1965 Twin Comanche. Welcome. I first became interested in the practical application of legal ethics in law school. As an alternative to a written final exam, my buddy, John Gray, and I collaborated on a project to demonstrate our comprehension of the then-intricate rules of attorney advertising by writing and producing unethical legal radio advertisements which systematically violated each and every rule. Later, John Carver and the University of Denver College of Law gave me the opportunity to teach Legal Professional as a Lecturer in Law at DU. About the same time, I joined the Colorado Bar Association's Legal Ethics Committee, one of the finest groups of professionals with whom I have ever been associated. I have been a member of the CBA Ethics Committee continuously since 1986, and have served longer as the in-house ethics adviser for our firm. Between teaching, CBA Ethics Committee work, analyzing our firm's own day-to-day ethics and legal practice issues, representing other attorneys as a counselor or advocate, serving as an expert witness and lecturing, I have amassed a fair amount of research on legal ethics and issues related to the practice of law. I have amassed an even greater number of opinions regarding these subjects. Please be sure to read the disclaimer of affiliation and related matters before using the materials published here. From this page, you will find various articles I have authored on subjects pertaining to legal ethics and the practice of law. You will also find, from time to time, opinion pieces on whatever issue is obsessing me at the moment. I have also included a few, select links to other ethics sites and materials I have found useful. The rules, policies and practices relating to legal ethics and the practice of law are dynamic, so I periodically update, revise and add materials to this site. Please check back from time to time to see what is new. Hot Ethics Issues in Colorado Law Practice Today by Charles F. Luce, Jr.
Ex Parte Contacts With Former Employees: Gold Mine or Land Mine? Attorneys' Fee Disputes: Will Your Agreement Hold Up? Who Owns the Client File? Unbundled Legal Services: Can the Unseen Hand be Sanctioned? Attorney Advertising After the 1997 Overhaul of the Colorado Rules of Professional Responsibility: How Are You Affected? The American Bar Association's Ethics Website, including EthicSEARCH, the ABA's Ethics Research Service. National Organization of Bar Counsel"
What would a good legal website be without a few disclaimers? In addition to the general disclaimers for the Moye White LLP website, this site and the materials published on it is unaffiliated with, and unendorsed and not approved by any organization, including, without limitation, Moye White LLP, the Colorado Bar Association, its Ethics Committee, or the National Football League. The author does, however, 'fess up to holding most of the opinions expressed himself. Those he doesn't hold are intended to provoke thought and debate. Despite the adoption of the ABA's Model Rules of Professional Conduct by virtually all states, actual state implementation and interpretation of these rules is distinctly ununiform, and the law in this field is constantly evolving. Since no wealthy patron has stepped forward to enable me to quit my day job, and since the opinions expressed herein are often opinions regarding what the law should be or speculation as to where the law is headed, these materials should not be relied upon as anything more than a starting point for research. The particular fact situations, local rules and interpretations thereof, and the user's independent professional judgment will in all cases be required.